Product Details-Imported high-class latex toy, It Squeaks .Supervise your pet while playing, Check for signs of wear and tear, and remove damaged toys immediately. 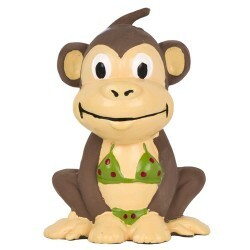 Product Information-Pet Brands introduces wildness to your pets world with this charming little bikini-clad monkey. The high-quality European toy is made of latex and has a fine and soft texture, making it a very attractive dog chew toy. It is a fun puppy toy and is suitable for smaller breeds of dog as well. The toy monkey would give endless hours of fun and would squeak its way to your Fido?s heart.